Imaginative reconstruction of a lost but strangely influential episode in the history of British colonialism. In 1830, Robert FitzRoy, the new captain of the Beagle, sailed his craft into a natural harbor off Tierra del Fuego, a place of “appalling weather conditions” and “cruel geography.” There they encountered a few weather-beaten natives, a few of whom were commandeered and taken away as specimens for scientists to ponder. Some of these unfortunates died (of smallpox) in passage or soon after landing in England, but one who survived was a young man called Jemmy Button, who was poked and prodded for about a year and then taken back to his homeland when FitzRoy again pointed the Beagle toward South America. Aboard ship with Button this time was the newly hired naturalist Charles Darwin, who saw in the young man evidence of what the ancestors of humankind, “naked and bedaubed with paint . . . their mouths frothed with excitement,” must have been like. Hazlewood hazards that Darwin’s brief encounter with Button influenced the budding scientist’s thoughts on evolution—and Darwin himself wrote, years later, that he would “rather have been descended from [a] heroic little monkey” than from “a savage who delights to torture his enemies.” Having seen the far shores and learned a little English, Button was out of place in his homeland—a place that Hazlewood suggests was indeed not innocent of cannibalism and torture. He acted as something of an unwilling point man for missionaries sent to Christianize his unwilling compatriots, most of whom died in any event of disease and, later, of gunfire from gold-seeking strangers—murders which Button may well have avenged in the slaughter of an unfortunate party of British sailors. 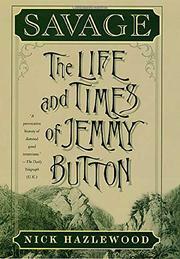 An intriguing account of Button’s troubled life, told with skill and grace.